Out of Africa: Did humans migrate in a single wave or in phases based on weather? Considerable debate surrounds the migration of human populations out of Africa. Two predominant hypotheses concerning the timing contrast in their emphasis on the role of the Arabian interior and its changing climate. In one scenario, human populations expanded rapidly from Africa to southern Asia via the coastlines of Arabia approx. 50,000 to 60,000 years ago. 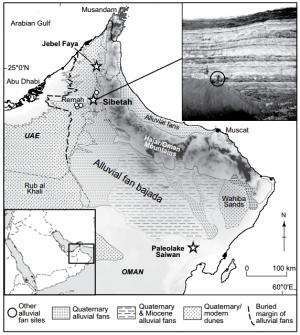 Another model suggests that dispersal into the Arabian interior began much earlier (approx. 75,000 to 130,000 years ago) during multiple phases, when increased rainfall provided sufficient freshwater to support expanding populations. Ash Parton and colleagues fall into the second camp, writing, "The dispersal of early human populations out of Africa is dynamically linked with the changing climate and environmental conditions of Arabia. Although now arid, at times the vast Arabian deserts were transformed into landscapes littered with freshwater lakes and active river systems. Such episodes of dramatically increased rainfall were the result of the intensification and northward displacement of the Indian Ocean Monsoon, which caused rainfall to reach across much of the Arabian Peninsula." Parton and colleagues present a unique alluvial fan aggradation record from southeast Arabia spanning the past approx. 160,000 years. Situated along the proposed southern dispersal route, the Al Sibetah alluvial fan sequence provides a unique and sensitive record of landscape change in southeast Arabia. This record is to date the most comprehensive terrestrial archive from the Arabian Peninsula, and provides evidence for multiple humid episodes during both glacial and interglacial periods. Evidence from the Al Sibetah alluvial fan sequence indicates that during insolation maxima, increased monsoon rainfall led to the widespread activation of drainage systems and grassland development throughout regions that were important for the dispersal of early human populations. Previously, the timing of episodes of increased humidity was largely linked to global interglacials, with the climate of Arabia during the intervening glacial periods believed to be too arid to support human populations. Parton and colleagues suggest, however, that periods of increased rainfall were not driven by mid-high latitude deglaciations every ~100,000 years, but by periods of maximum incoming solar radiation every ~23,000 years. They write, "The occurrence of humid periods previously identified in lacustrine or speleothem records highlights the complexity and heterogeneity of the Arabian paleoclimate, and suggests that interior migration pathways through the Arabian Peninsula may have been viable approximately every 23,000 years since at least marine isotope state (MIS) 6," about 191 thousand years ago. Aboriginal occupation of Australia dates back at least 60,000 years so doesn't that provide support for the earlier exodus?